The Rangers once again proved that it is hard for them to throw back-to-back clunkers as they rebounded from their 5-3 loss in Tampa on Wednesday night with a a solid 3-0 whitewashing of the Florida Panthers. Official recap is here. Thankfully, the Panthers do not have the scorers or speed of the Lightning because Florida outshot the Rangers 40-19 for the game. However, many of the shots were clearly seen by Henrik Lundqvist and many rebounds were cleared by diligent forwards and defensemen. Henrik did make a couple of spectacular saves including stopping a tip-in try in the first period and shooting out his left leg to make a pad save to thwart Mike Santorelli's shot on a 2-on-1 in the second period. He and his teammates faced down 2 four minute man advantages without yielding a goal. Meanwhile, the Ranger special teams were markedly improved from the Tampa game. No goals on 5 PP opportunities for the Panthers including a 4 minute penalty in the first period. Shortly after that kill, the Rangers struck for their first goal thanks to quick puck movement by Staal with a pass to Avery streaking out of the penalty box that led to Sean's shot off Scott Clemmenson (former Devils goalie) leaving a perfectly placed rebound for Derek Stepan to convert. There's nothing more exhilarating for a team to conclude a long penalty kill with a goal of their own (of course, a shorthanded goal is just as sweet -- foreshadowing alert). The first period ended with the Rangers outshot 15-5 -- a disturbing trend recently that bears some analysis after this stretch of games is completed. Stepan was on the first line with Brandon Dubinsky and Marian Gaborik and all three had a wonderful chemistry. Stepan scored for the 2nd game in a row (points in 6 games in a row) and missed an open net in the 2nd period that could have proved crucial later. Coach Tortorella increased Gaborik's minutes to 20 for the game and exhorted him to play harder. He certainly did with some quality shifts on the penalty kill as well. The second period was scoreless and saw plenty of activity in the Rangers' end. In the third period, the Ranger special teams struck for 2 goals. First, in a picture-perfect display of power play proficiency, Eric Christensen won a faceoff to Steve Emminger who passed it back to Christensen along the right boards (Eric had sprinted over from the left faceoff circle to get into position). Christensen then centered a pass to Ryan Callahan between the circles who deflected the puck past Clemmenson to put the Rangers up 2-0 with 5:34 gone in the 3rd. It was the 4th straight game in which the Rangers have scored a power play goal. Later in the 3rd, Brian Boyle was whistled off for interference with 6:41 remaining. This was a potentially critical moment of the game. The Panthers had picked up steam and even had a goal waved off because it was batted in by a Florida player hand. During the penalty kill, 3 Panthers got caught deep in the Rangers zone. Brandon Prust moved up the left side past the Rangers blue line and worked a 2-on-1 up ice. 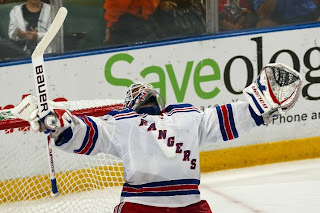 Seeing that there was no pass option, he wristed a shot between Clemmenson's legs that gave the Rangers an insurmountable 3-0 lead with 5:35 left. For the remaining 3:36 of the game, the Panthers pulled their goalie. 11 skaters filled the Rangers defensive zone for nearly 3 minutes without a break or a clear. Thanks to the density of players, the Rangers were not scrambling all over as in a normal power play. 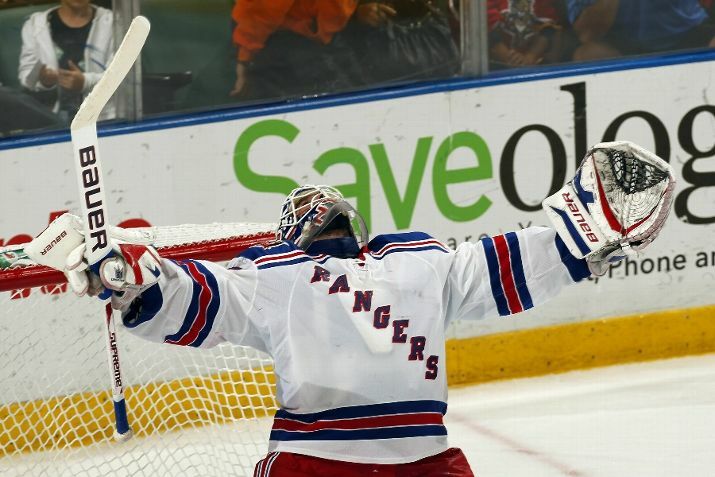 Henrik made some key stops, the Rangers kept moving the puck but could not get the puck out of the zone until finally it was cleared with only a few seconds remaining, thus keeping the shutout intact. Hockey is a strange game -- Tampa scored the first 5 goals against the Rangers in the first 2 periods of their Wednesday victory over the Rangers. The Bolts gave up 3 goals in the final frame of that game and then got shutout in D.C. yesterday, 6-0. So after looking invincible for 2 periods, they yielded 9 goals over 4 periods. Meanwhile, the Caps had been shut out twice within 3 games last week, including one by the so-far woeful Devils. Tonight the Rangers visit Nashville with their vocal fans to complete this 3 game in 4 night road trip before returning home to face the Penguins on Monday night at MSG. As has been reported, during the 7 weeks ending December 5, the Rangers will have played the most games of any team in the NHL -- 24 games in 46 days. So if you have been thinking the Rangers have been playing frequently, you are correct. The fact that they are staying solidly in the pack of the Eastern Conference despite missing several players and integrating new players is a testament to their work ethic and their coaches. But oh graying Manyis the players that are out hurt are worse than the players that are playing. You are right about mixing in new players but sther should be looking to replace players as the invisible EC and Frolov along with the in the wrong place Gilroy and Emminger.This is nor a cup contendening team as much as that hurts me to say so why is Fedotenko here instead of a yougster who can be learning how to be a NHL player.Then of course Torts is not the right coach for this team .He is out of touch with the new NHL and does not know how to use all of his players which needs to be done in this eras game. Thanks for your comments. We are thinking about these very issues and plan to address some of them when the schedule has a bit of a break. NOw that the team has played more than 1/4 of the schedule, it is a good time to make some assessments.